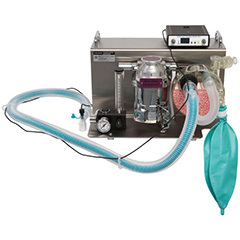 The VOC is a continuous flow anaesthetic system manufactured in Australia at the MDI laboratory. The machine incorporates Rotaflush Flowmeter. 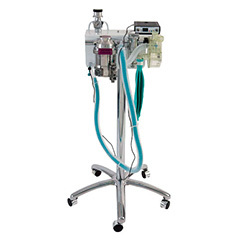 The simplicity and robustness of the VOC anaesthetic machine makes it a safe and dependable addition to any operating room. Available in trolley, bench or swivel mount with optional extras such as oxygen cylinder support and out-of-circuit vaporiser. The VOC machine can be manufactured to accommodate individual preferences. 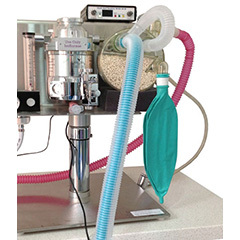 Provides accurately metered oxygen flows between 0-4L/min and incorporates an Oxygen Flush (Bypass) to rapidly inflate the breathing bag when required. With Soda Lime 1Kg pack with 400g capacity filler and adapter supplied. Stainless steel base with mounting slots for an out-of-circuit vaporizer. 23mm Taper Fittings for out-of-circuit vaporizer.